Apple has released iOS 8.4 for compatible iPhone, iPad, and iPod touch devices. The version most prominently features the inclusion of a redesigned Music app with the Apple Music service, a streaming music and radio feature with a separate monthly fee. iOS 8.4 also includes a few minor bug fixes and improvements to iBooks and the operating system itself, complete release notes for iOS 8.4 are repeated below. Always backup the iOS device to iCloud or iTunes before updating system software. The simplest way to download and install iOS 8.4 is through the Software Update mechanism on the iPhone, iPad, or iPod touch. Users can also choose to install the update through iTunes and a computer, or manually with firmware files. However you choose to install iOS 8.4, do not forget to back up the device beforehand. Direct download links to iOS 8.4 IPSW firmware files are included below, right-click and choose “Save As” and be sure the file has a .ipsw file extension when saving. Using IPSW files to update is not particularly complicated, but it is generally best reserved for advanced users. Most users should update to iOS 8.4 through the OTA software update mechanism. 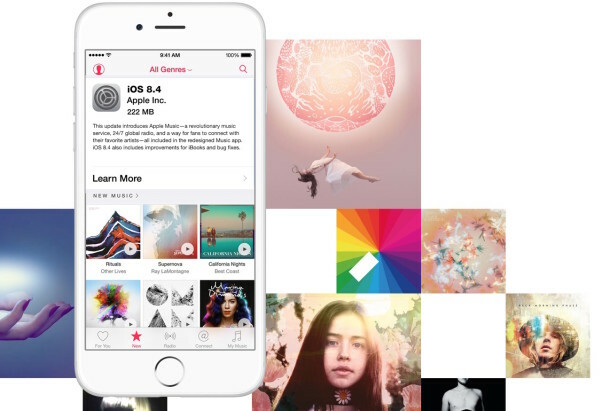 This update introduces Apple Music—a revolutionary music service, 24/7 global radio, and a way for fans to connect with their favorite artists—all included in the redesigned Music app. 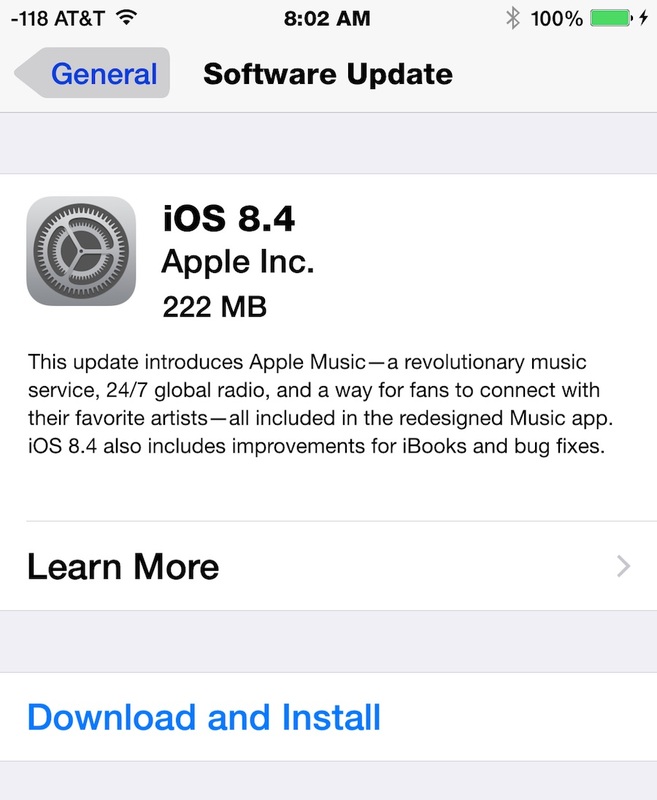 iOS 8.4 also includes improvements for iBooks and bug fixes. Separately, Mac users will find OS X 10.10.4 Yosemite Update available through Software Update. I don’t care much about the radio thing. Update anyway. I’d listen to the Apple Music in iTunes, but still waiting for that. Also don’t want to update my iPhone, 128GB device is basically full so if it bricked with the update it would take a decade to restore from iCloud. I need to use the phone, don’t care that much about some music service, can’t afford the downtime. Simply don’t trust iOS updates at all anymore, let alone OS X updates. Yup, gotta update my Mac too, but on the road, so not going to happen for a few weeks. Annoying, un-Apple like. Kind of reminds me of jamming the U2 album onto the phones. LoL. Right… because Apple has been keeping the three month preview totally secret and the three month period hasn’t been in the news AT ALL. Where exactly would you expect a control for it to be, other than in the same settings pane every OTHER Automatic Renewal is managed with? Yes, clearly Apple is being so un-Apple-like and ever so sneaky. So Beats1 radio is basically all rap and weird pop music, target audience is suburban and urban 13-24 year olds I guess? Why bother with Apple Music if there’s no free to listen with ads version? Does iTunes Radio still exist? I’ll stick with Pandora or Spotify, don’t mind the radio ads. No interest in paying yet another monthly bill to Apple, annual $850 for iPhone + $50/year for iCloud, plus upgrading a $2000 Mac every 2-3 years is more than enough for me. You are not a true fanboi with that attitude, and Tim Cook would not be pleased with you! Should iOS 8.4 will support my iPhone 4s ?? Can’t believe this Beta 5 was released . Thought only MS did that on their way to irrelevance. Guess that’s where apples going. Disgruntled Location Services no longer working IPad user. Not only do they not post a fix they deny the problem even exists and erase your posts from the Support Site. Mmmmmm. Denial is a symptom. Just put 8.4 on my iPod touch, and I sorry to say the music player is terrible, I know what I’ve recently add so stop telling me, and I don’t want to follow or add anyone to a bloodily station. The whole interface is now very cluttered and harder to use, what happened to the fast forward option on a track, that if you can find a single track and not just have the whole album play. Will someone at Apple start to sack the idiots that are now in control of iTunes and the music app they are make a right guck up of the whole system. I have an issue with the fact that music that I have had is some how gone I had over 2700 songs on it and now I have 2400 where is my music and why is it that I cant find it anymore tried to reapply it from my computer and it wont let me help please I just want to listen to my music that I already paid for once will not buy into the Apple music ever. That is the longest run-on sentence I’ve seen in, sheesh, years maybe. Punctuation makes things readable, like your comment, which is not even clear if it’s a question, or just a rant, or a wonder. But your iPhone music is always in Apple Music, open the Music app on the phone, listen there. I downloaded the iPad Mini (WiFi) file, and it came up as iPad2,5_8.4_12H143_Restore for the file name. Does that mean it won’t work the restore my iPad from? I need to be able to do so to Jailbreak my device. If not, does anyone have a link to a file that does work?